8 April 2014 – The winning entry to an Ellesmere Port public art competition has gone on display as a giant mural on the side of a local taxi firm’s building. 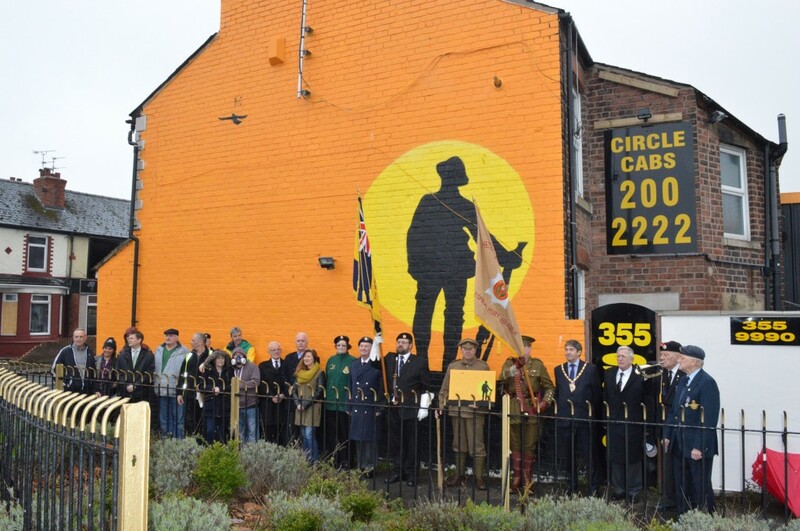 Mayor of Ellesmere Port, Councillor Bob Crompton officially unveiled the 8 x 6 metre design alongside veterans from the Cheshire Regiment Association – some of whom in First World War uniforms, to create a colourful event. Flags were lowered at the event and the Last Post was played to mark the occasion. Mayor of Ellesmere Port, Councillor Bob Crompton, said: “This is an inspirational piece of art work which graces our town with its spirit of remembrance. The theme of the art competition was ‘Peace and Reconciliation, WW1 Centenary’, and forms part of the Ellesmere Port Arts Festival – which is taking place in the town from March 6 to April 27. The winning design, titled ‘A New Beginning’ by local artist Silent Bill, was chosen as the favourite by the competition’s committee and has now been recreated in full on the side of Circle Cab’s building on Princes Road. Dave Thomas, owner of Circle Cabs, said: “When I first viewed the artwork ‘A New Beginning’ as a draft I was very impressed with the message the artist was trying to portray. The Council commissioned the artist to install the work as part of the programme of town centre improvements, supporting the regeneration of Whitby Road as a key gateway into town. The area is a priority in the Vision and Strategic Regeneration Framework as adopted by the Ellesmere Port Development Board. Runner up in the competition was Owen Mageean, whose artwork ‘Peace and Reconciliation’ is currently exhibited at the Council’s Civic Way offices. The winning piece was chosen by a committee, chaired by Cllr Justin Madders, with expert advice from Professor Neil Grant, Head of the Fine Arts Department from the University of Chester. All entries were submitted to the Paperboat Gallery. Local Councillor, Justin Madders, said: “The standard of entries was really high and I am pleased that we were able to display the runner up, Owen Mageean’s entry in the Council offices. The mural will be displayed for at least one year, with a possibility for it to remain in place for longer. For more information please contact jochem.hollestelle@cheshirewestandchester.gov.uk. PHOTO: The celebration for the unveiling was attended by Councillors Justin Madders and Paul Donovan, the Mayor of Ellesmere Port, Councillor Bob Crompton, and members of the Cheshire Regiment Association.